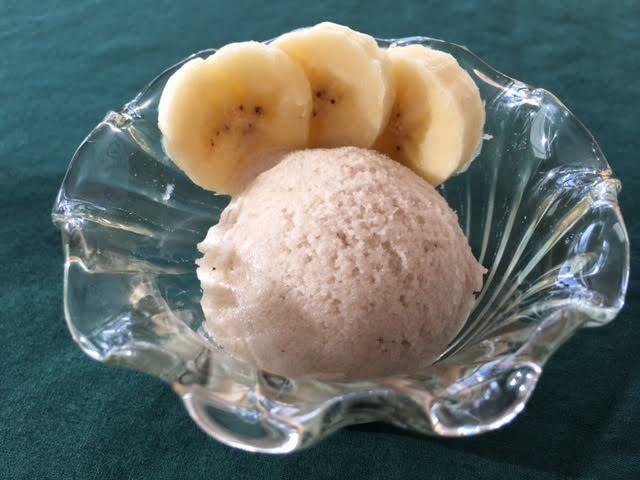 Banana sorbet is a great way to use bananas that are very ripe–especially if you’re tired of making banana bread or don’t want to heat up the oven–and serve something extraordinary to your friends and family. We put a scoop of this on our bowl of fruit for breakfast. But you can take it far beyond this–think about a new version of banana splits using this sorbet, or just eat it for dessert with chocolate sauce. P.S. We have a 1-quart Cuisinart electric ice cream maker and use it all the time. My next experiment will be melon sorbet with those flavorful Tuscan melons from Costco. In a small saucepan, stir together sugar and water. Bring to a boil, then remove from heat and allow to cool. When the sugar syrup is cool, process with bananas in a food processor or blender. Put into airtight container and chill several hours or overnight. Freeze in ice cream maker, chill to firm up.